A team of enthusiastic young black entrepreneurs launched a wellness centre at the OR Tambo airport, joining the international trend to establish ‘airport cities’ across the globe. Launched in early February this year at OR Tambo International Airport (ORT), the Phela-Live Wellness and Fitness Centre is a first-of-its-kind concept in SA. It will see health and wellness being incorporated in a holistic experience for ORT employees as well as travellers passing through this African portal. 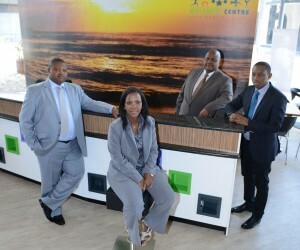 The centre, which will bring together two vital components in holistic wellness, fitness and relaxation, is the brainchild of a talented team of South African entrepreneurs: Tshepo Mokgoatjana (General Manager), Mpho Mohale (Managing Director), Samora Mtsi (Finance Director) and Khasiane Mohale (Executive: Health and Safety). BBQ spoke to the Phela-Live team and found out more about this exciting new venture. How was the Phela-Live concept conceived? TM: We have a very diverse team. Mpho is a very visionary person, and has the capability of looking at something, seeing its potential and being able to visualise the finished concept, communicating that vision to us. More than two years ago, he started talking about the issue of wellness. There is a sports field at the back of the airport, which the airport uses once a year for its annual sports day. Our other business enterprise servicing maintenance at the airport was contracted to cut the grass, tidy the area up and ensure it was ready for the sports day. We realised that the facility was not really being used to its full potential, and thought about building a gym there. As we worked through the concept we decided that this area was not the right place for such a facility. Mpho has always been passionate about health and wellness and always reminds us that our health is our greatest asset, especially because we all work so hard in our lives. He suggested that we come up with a way to preserve our health, instead of just spending it all in the pursuit and creation of wealth. When we saw this space, formerly the International Trade Centre building, we realised that it was ideally suited to the development of a wellness centre. MM: When I was growing up, I was a health fanatic. I have a second Dan in black belt martial arts, so throughout my young life I have always been in training. However, in later life, one gets caught up with work commitments and working life with its pressures and the reasons not to exercise start to catch up with you. However, as you grow older, you realise that your health and wellness really are your greatest assets and need to be looked after. It is difficult for many people to actually do that. The airport is like a small city. There are around 22 000 people working here every day in various shifts. As a company working here ourselves, we saw the need to bring an environment where people don’t need to deal with the hassle of road traffic to get to their gym and wellness centres. The concept for Phela-Live was born out of this initial germ and it has grown over the last three years. Our research suggested that most of the companies working at the airport had employee wellness programmes, yet many of them only had facilities to offer employees counselling, stress and trauma support – all reactive offerings in the face of employee ill-health, not really proactive preventative wellness offerings. If you’re healthy, it is more likely that you will become a better functioning and happier employee in the workplace. As a team we also found that we were working too hard and getting stressed and there was nowhere at the airport hub to really go and de-stress, work out and get fit. SM: It is true that when employees are stressed and unfit, it has the potential to affect a company’s bottom line, which relies on those employees being able to perform their duties each day. Looking at international trends, a lot of global companies have picked up on this fact. More and more companies in South Africa are also realising that employee wellbeing is good for business. Many South African companies have started internal corporate gyms. Some of the companies here at ORT are head offices. They have corporate gyms and understand the value of wellness for their employees. When you start looking at the costs in terms of medical aids, sick leave, and also the lack of productivity among employees due to wellness issues, all of this translates into an impact on the bottom line. Various studies have been done into this area. Years ago when we were presenting to ACSA and presented the slides, it was like preaching to the converted. They agreed with these findings and the impact on their own business. There is a great realisation that the wellness programmes that these companies are engaging in actually need to change, as a lot of them are reactionary. It has been proven that the biggest factor around wellness is ensuring mobility. If you can keep people mobile, if you can get people to exercise, even if it is only for 20 minutes a day, it will make such a difference to people’s quality of life. What are your collective corporate backgrounds and what is your prior experience or interest in the fitness and wellness sector? KM: Starting with Mpho, he is a facilities management expert and has worked in the past for a range of international companies, bringing a vast range of construction and maintenance experience to the new venture. Being a sports fanatic, Mpho plays a major role in a number of aspects of the business. Samora is our financial planning specialist. He is good with numbers. His academic background is in accounting and financial portfolio management, so his corporate administrative skills will also contribute hugely to the effective day-to-day running of the company. Tshepo is a trained communicator with vast experience in the world of journalism, including working as a producer in prime-time television here in South Africa. I have worked in the fields of health and safety and environment management within the corporate environment, and will be contributing those specialist skills to the new venture. Can you tell us how your previous corporate experience will add value to your business? SM: Working for corporate giants, we have all learnt about being disciplined. When it comes to the level of professionalism required to be able to compete with the big wellness companies such as Virgin Active and Planet Fitness, we do have that invaluable level of corporate exposure. We have all been in management in such large-scale corporate organisations and, at the end of the day, running a business is running a business. You do not necessarily have to be a technical guru in a particular sector. I believe you build great teams to help you to operate the business and play in different sectors. We have proven this so many times in the past regarding the other businesses we own and operate. We have sometimes been accused of fronting, with people commenting that there is no way that a business that is run by young black professionals could actually operate at this level. But we say, there are the businesses, there is no-one behind us, this is the team that is making those businesses a success. We believe in going against the grain. It was very clear, very early on in our lives, and we have known each other for a very long time going back to tertiary education level. We were always the ones to question everything and to find new and better ways of doing things, not necessarily the established way. MM: You could say that we are mavericks in the business world, in a positive way. We understand there is a certain academic way of doing things, yet this is balanced by the reality of the business world and how things are really done. We have travelled and done business extensively in Africa and have visited China. We have spoken to people, we have seen how things are done, and we have learnt that there is never only one way of doing things. It is essential to adapt in business. In SA there are a lot of business opportunities, but sometimes people do not concentrate on finding and realising those opportunities. As business people, we want to tap into that. It is becoming more of an enabling environment for the entrepreneur. It is a case of formulating the right strategies, accessing the opportunities and maximising them. 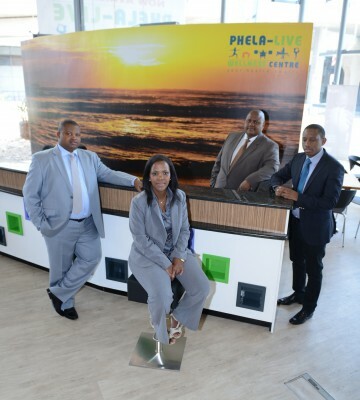 Tell us about Phela-Live as a fitness and wellness concept. Why the idea of locating this concept at an airport? TM: It is all about location, location and location. We didn’t want to just build another retail operation in this unique location, otherwise we would simply have opted for a franchise opportunity with an established wellness brand. We wanted to launch a new boutique wellness offering at this important location, one that had a personal touch and a distinct style in terms of décor and ambiance, and product offerings. A key selling point for selecting this location was the fact that each day, around 18 000 people are located in this airport hub. If you as a company take a decision to build something so personal, something so grand, then there is no better place than the airport. However, the decision was based upon solid business fundamentals and research. Before we considered opening this centre, we met with the airport management and we took with us our research based on surveys with individuals working within the airport hub. We asked those being surveyed if, presented with a world-class fitness and wellness facility at the airport, would they join? The response was both positive and enthusiastic. We then met with ACSA and took with us a dossier containing all our research findings together with our proposal. The end result of this process was that before we have even opened our doors officially, people have come to sign up for membership. So, ultimately the decision to locate Phela-Live wellness centre was based upon sound market research data and solid business principles and practices. Already at prelaunch phase 1 000 people joined, which surpassed the target we set for our prelaunch member marketing campaign. Is the strategy to build on the global trend towards developing airport cities, and as a result creating new fitness and wellness hubs based at airports? MM: In terms of the aerotropolis concept, there was not a clear direction for any of us to follow. Someone had to make a bold move and we believe that is what we are doing. Other businesses will see what we are doing and will see that the idea of an aerotropolis development can be a reality, not only in South Africa but across the African continent. We listen to people’s ideas, to their specialist expertise, to their counsel and we ensure that we work even harder to realise the idea of a new fitness and wellness hub concept based at airports. Airport companies are creating an enabling environment for companies such as Phela-Live and we have been engaging them for the past two years in our concept as part of their airport city planning. They are keen to make sure that an enabling environment is created so that concepts such as ours do not fail and can contribute to the creation of successful and vibrant airport city hubs. Can you tell us more about your range of innovative and technologically advanced offerings? SM: The MyWellness Key offer is a critical part of this unique offering and will be fully integrated into the client experience. The key not only provides you access to the facility, but it is a key into which will be loaded all your personal fitness and wellness programmes, so even if your personal coach is not available, you have a choice of using Phela-Live’s full range of coaches, or your key provides all the information you need on implementing successfully and safely your personal programme. You are able to load your personal programme onto the machine and it will guide you. When you get onto the treadmill, just plug your MyWellness Key in and it will load your personal programme onto that piece of equipment, telling you how many kilometres you have to run, at what speed, and advise you on the duration of that particular programme. It tracks and uploads your performance as you go. There is also a cloud-based offering, the MyWellness Cloud where all of that personal fitness information will be made available in the cloud, so you can be anywhere in the world and as long as you have internet access, you can log in to the MyWellness Cloud, download your fitness and programme statistics and you are able to utilise that information wherever you are. Many of our members may be members of a programme such as Discovery and Vitality and the interesting thing is that such programmes accept you from credible sources to monitor your progress as part of your general health and wellness care. For the regular business or leisure traveller, this MyWellness Cloud integration is a unique selling point for Phela-Live and one that resonates with the traveller on the move who still wants to ensure that they maintain their health and fitness wherever they go.One of the beauties of this facility is the actual building itself – the sheer amount of space available. So, we have large studios that can accommodate large numbers of people comfortably. Our large aerobic studio will be implementing a whole range of programmes including Pilates, right the way through to yoga. Phela-Live has brought in a highly experienced fitness manager who has trained in the United States and who has developed a whole range of exciting programmes for those people who are looking to access the latest health and fitness techniques.